Howdy guys! How are you? Today I've got a beautiful metallic polish to show you, as well as an amazing druzy ring to go with it! 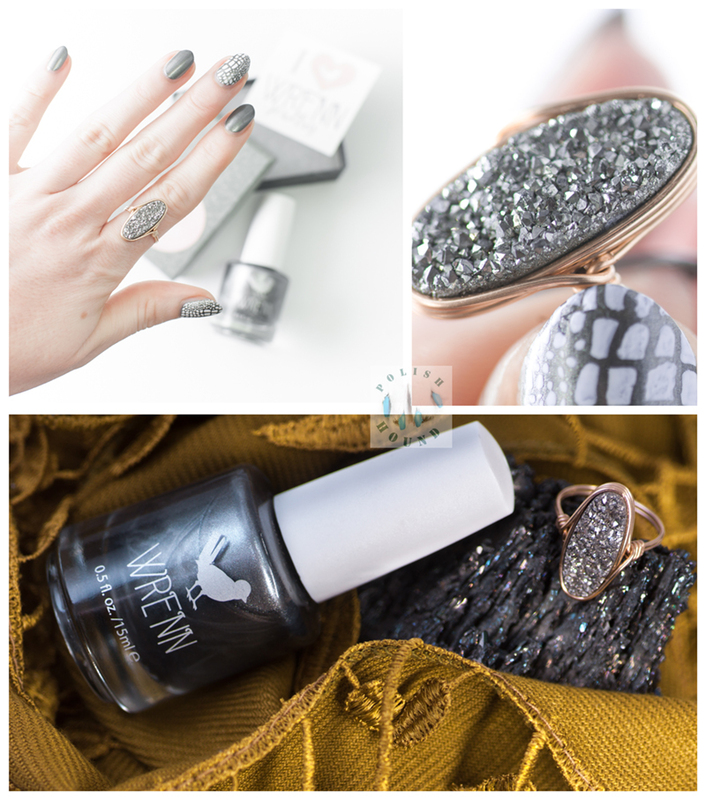 The polish is Wrenn Polish- To Infinity... and the gorgeous ring is the Shop Wrenn Carolyn Ring in Meteorite Druzy! 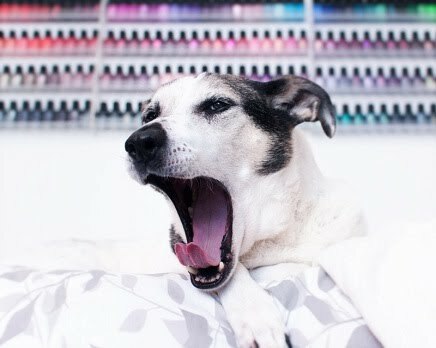 This polish shade was actually inspired by this particular druzy stone color. How cool is that?! Wrenn Polish- To Infinity... is a medium silvery-grey with a metallic finish. I think this is a very neutral-undertoned grey! On me it pulls slightly warm, I think, but my skin is very cool-toned. It's very close to the Meteorite druzy tone and color, although both can look cooler-toned or warmer-toned depending on the quality of light and how it reflects. I love grey polish, and this is no exception! The shimmer in this shade is ultra fine-milled, and it can show a subtle green/yellow/warm color, while the base is a lot cooler. My stamped accents nails were done with MoYou London- Pro XL 05, and I used KBShimmer- Eyes White Open to stamp. I love how textural they look, and it was very fun to wear this look with this lovely ring! Formula: It's got a medium viscosity but is actually very pigmented. It's essentially opaque in one coat if you wrap the tips correctly, but definitely easily opaque in two coats. It's easy to work with, self-leveling, and brush strokes seem to dry down a bit; but, due to the nature of the finish you'll still want to try and paint in straight lines. Overall, quite nice! I love this combo so much- so sparkly! Look at the macro! I also really love how elongating the Carolyn ring shape is. So pretty! Meteorite really is the perfect name for the color of this druzy stone. Carolyn is a wire-wrapped ring (as opposed to bezel set), and I think the look is really classy and interesting! This particular one is done in the 14K Gold filled version, by the way. Are you feeling metallic shades for Fall/ Winter?